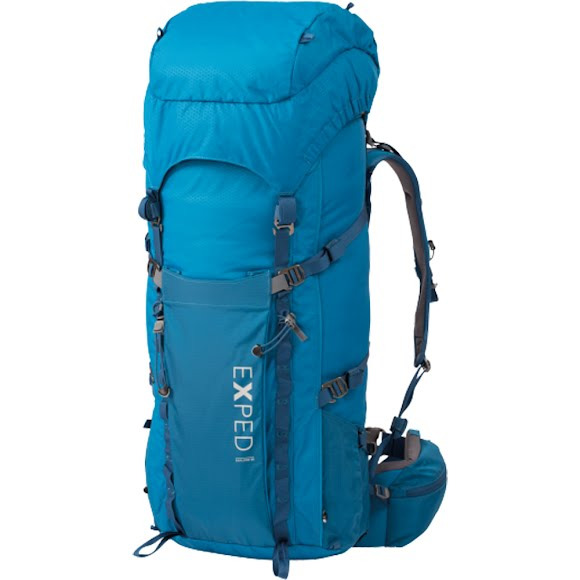 The Explore shines as a versatile, durable and highly functional trekking pack. Its refined, comfortable and seamlessly adjustable suspension system with excellent load transfer makes it the perfect choice for all types of treks. The main compartment can be accessed from the top as well as from the front and sides through the zippered front panel. The Explore shines as a versatile, durable and highly functional trekking pack. Its refined, comfortable and seamlessly adjustable suspension system with excellent load transfer makes it the perfect choice for all types of treks. The main compartment can be accessed from the top as well as from the front and sides through the zippered front panel. The floating lid features a generous outer and a flat inner pocket. Small personal items are readily accessible in the hipbelt pockets and larger items like water bottles or rain gear in the pleated side and front pockets. Four base loops can be used to attach sleeping mats, tent etc. Two aluminum stays (6061-T6 Alu) with upper load spreader and direct connection to hipbelt for outstanding load control. Elaborately shaped dual-density foam hipbelt with partial PE board reinforcement is supportive and molds itself around the hip. Excellent back venting due to limited contact points. Adjustable top pocket height can be easily adjusted positionwise thanks to the (removable) top compression strap - very helpful when pack&apos;s main compartment is not fully loaded, so that top lid stays nicely positioned on top of pack. Measurements Backlength range: 16.1"-22.8", Hipbelt range: 33.1"-54.3"